Sheffield Eagles will have to look elsewhere for a League One dual-registration after last season’s partners Hemel Stags withdrew from League One for the 2019 season. Director Mark Aston has already brought Stags duo Sonny Esslemont and Louis Sheriff permanently to the Steel City for next season, deals which have been set in place following recommendations from Hemel coach and ex-Eagle Jack Howieson. Aston was keen to keep the relationship going for 2019 after last season’s spell in League One for Blake Broadbent helped propel the forward into Aston’s first-team. 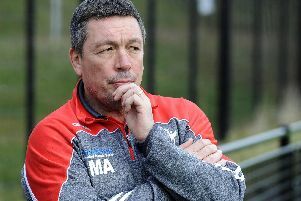 With the Stags training in Sheffield, the partnership was perfect for the Eagles chief, but Aston has already been exploring other League One options with Hemel’s future far from secure after a difficult campaign last time out. At present the RFL have confirmed that there are no plans to replace the Stags, which means that League One will be an 11 team competition next season. Aston has previously stated that he is looking at a number of avenues for next season, whilst he also remains keen to link up again with St Helens after a successful relationship last season. Hemel, who were founded in 1981 as an amateur club, and had played in a number of different competitions before joining the semi-professional ranks in 2013, look set to apply to join the tier four Southern Conference competition that will be launched in the spring of 2019 – one of 14 expressions that have already been received.